Knipex have used special tool steel construction with PVC dipped handles for added comfort, durability and most important added grip. The Knipex 46 21 series of external bent circlip pliers are constructed from chrome vanadium solid style forged top quality steel with precision non-slip tips for added strength and durability. They have 90° bent tips. Like most of the Knipex range of pliers, all components are oil hardened with polished heads. 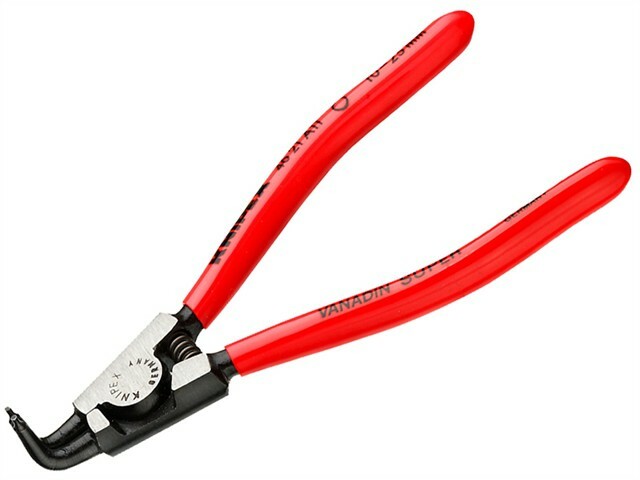 These circlip pliers have PVC dipped handles for added comfort, durability and, most importantly, added grip. Knipex circlip pliers are ideal for all trade or DIY applications and especially the automotive trade.